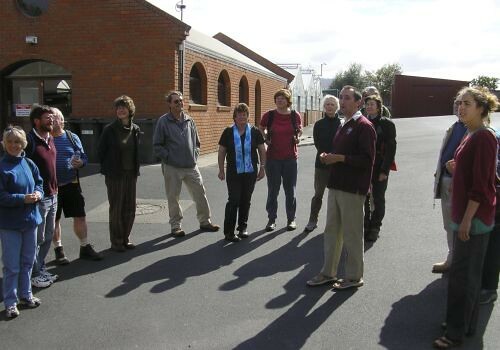 Co-ordinator James Wood meets field naturalists outside the seedbank at the Royal Tasmanian Botanical Gardens. 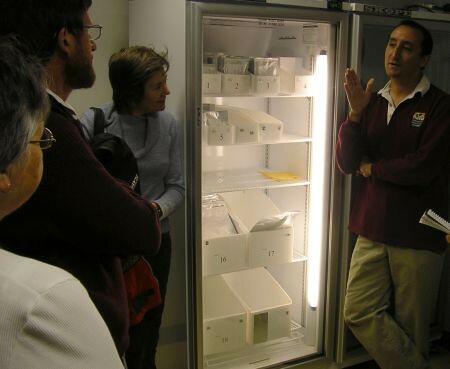 Explaining the storage of seeds in sealed foil envelopes in refrigerated cabinets at -20C. 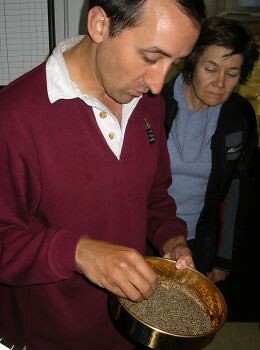 James showing a typical batch of seed in a sieve during the preparation stages. This zig-zag aspirator winnows the seed. 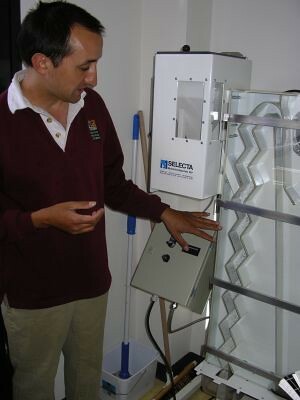 A current of air flows up the glass-fronted zig-zag passage; seed is automatically fed in at the left, dense seed descending against the current to be collected at the bottom, lighter material rising and passing over to the right. Because most of the species are not cultivated, an important aspect of the work is finding the best ways of germinating the seeds. 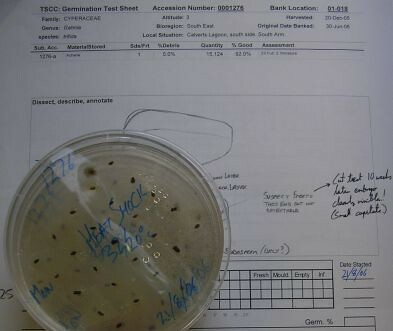 A test sample of Gahnia trifida in agar. 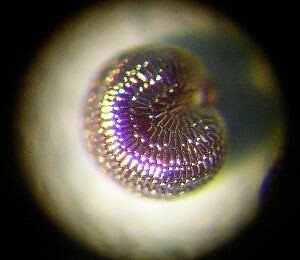 Checking a Calandrinia calyptrata seed through a microcsope. Showing us an interesting example of parasitism, where the parasitical seedling 'sniffs out' the host chemically and grows toward it. See below. 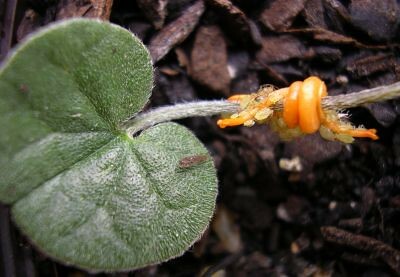 The orange Cuscuta tasmanica seedling coiled around its host Dichondra repens. Once it has attached itself, the parsite's root withers away. There are some aphids clustered on the C. tasmanica. See Bulletin No325 for our excursion report. You may also view the seed bank's intended collecting list (190KB pdf); there are explanatory notes at the end of the list. For a summary of the centre go to www.rtbg.tas.gov.au/tas_seed_conservation. 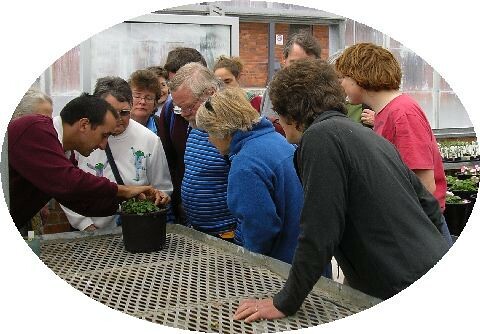 For an international overview go to http://www.kew.org/msbp/.